The RSC Prime M1 Speaker cable is a design concept taken from the RSC Air series speaker cable. The M1 speaker cable is the only speaker cable in the 'M' Series™ to use frequency tuned RSC Gen 2 conductors. The conductors are arranged using TARA Labs' Helix Array® around a very special blend of poly/organic material. This unique material exclusive to TARA Labs offers flexibility with increased tonal accuracy, detail and transparency not otherwise possible with lesser flexible materials. 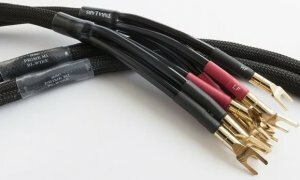 The RSC Prime M1 cables use SA-OF8N copper conductors. (Super-Annealed, Oxygen-Free, Mono-Crystal, Frequency-Tuned, 8-Nines-99.999999% copper conductors) All cables have: hand-polished conductors and are handmade per order in Oregon, USA. The RSC Prime M1 - is lifetime guaranteed. The cables arrive in a Mylar static bag, inside a TARA Labs box.